Kevin Crossley spent 15 years designing for video games before becoming a freelance illustrator and writer. In Character Design from the Ground Up, he shares the creative process he goes through for designing characters. This is more of a book of ideas. You should know the basics of drawing because the book does not cover drawing techniques but focus on the thought process. 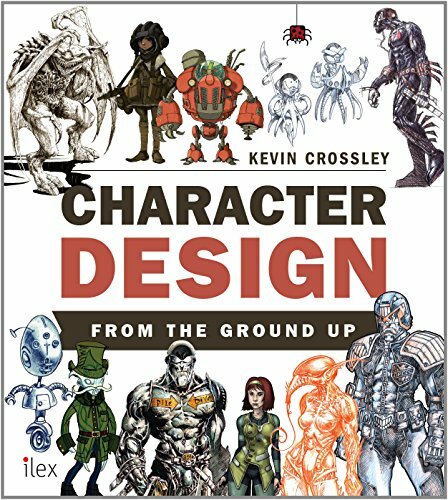 There are information like where to find inspiration, building your reference library, and multiple characters provided as examples where Crossley will explain step by step the iteration and reasons to what he has drawn. The tone is very casual and Crossley is very experienced which you can tell when he talks in length about his characters. Some useful tips for example are on how you can create your own character templates to quickly set up a base outline or pose to draw from, things to note when designing characters that must look convincing in 2D and 3D, keeping a sketchbook and constantly practising and drawing from life. There are also some guest artists such as Jonny Duddle and Paul Green giving advice and ideas. It's a pretty helpful guide to those into character designs. Another character design book you should check out would be Alive Character Design: For Game, Animation and Film. The book looks and sounds awesome, I'm something of a character designer myself. but there is no way on Gods green earth am I going to pay $534 for a used copy never mind $975 for a new one on Amazon. sorry I just can't justify paying that much on just one book, as good and insightful as it obviously is, my best to Mr Crossley.